← What kind of frog is this? …but it would certainly end one fast! STG58 with Cyclone muffler for hearing protection and 100rd Beta magazine for lead sufficiency. Ear muffs have built-in radio jack and stereo microphones that improve on un-amplified hearing, wearing eye protection is just prudent safety practice. Armor goes under the shirt for everyday wear during civil unrest. STG58 has an integrated bipod, so the full weight of the loaded rifle doesn’t have to be held aloft when firing from cover. The only down side is that a FAL would get quite toasty after a hundred rounds fired rapidly…but still less toasty than a Molotov Cocktail tossed into your home by a rampaging mob. Of course, I personally live in the land of accord and brotherly love, but I hear that’s not true for everyone. PS: A technical response to the comments on other web sites: STG58 does not have a good heat shield in the forend. About 40 rounds fired rapidly would warm it up past comfortable holding temperatures. So this particular photo is mainly tongue in cheek. That said, it does have a bipod and a carrying handle and those makes touching the forend less necessary when firing from a fixed position or moving. This entry was posted in interesting people, rifle, self-defense, sound suppressor, weapon and tagged 308Win, AAC, Beta, drum, FAL, high-capacity. Bookmark the permalink. I’d prefer a BM-59 but a FAL wouldn’t make me underguned either. 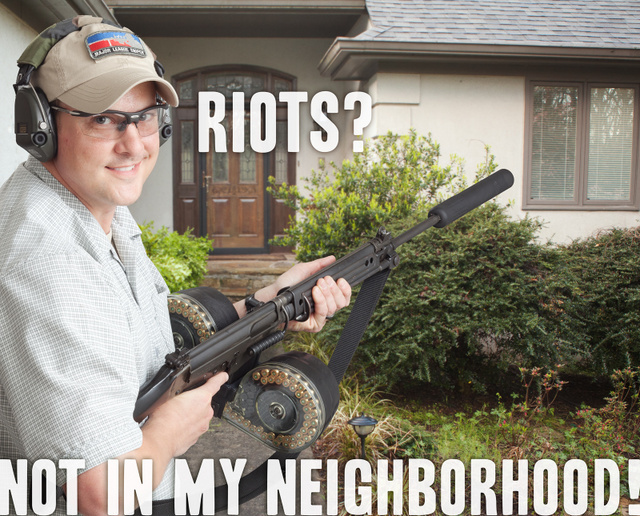 W/the Appleseed project bringing up more good riflemen This might be the case in a lot of “hoods”. At the last line, I had to go back and check the byline–it sounded like you had somehow resurrected Col. Cooper and had him guest-blogging for you! Not possible to apply some thermal paste to a FAL barrel and put some finned cooling jacket onto that? Have they ever published any engineering data relating to the cooling effect? The page just has marketingspeak. stg58/g1’s with metal handguards always REQUIRE oven mits. I see no exception in this particular circumstance. I HATE it when you put up pictures like this one! I love me some STG58. CTD carried a railed forend for FALs and may still have them. I might end up buying it yet, but the downside is the loss of the integrated bipod. That full Beta mag and can puts it up there near a BAR as far as weight. Still, it’s a lovely, comforting thing. I plan to bring my STG58 out this weekend for some exercise. She deserves it. Did they make the tower long enough that this can be used in an RFB? Yes, and I will post a photo of that shortly. Mobs are filled with cowards! After the first dozen fall, the rest will be trampling each other to run! Living where I do, some of us are allowed to keep our FALs but nobody is allowed to shoot them! That’s how our Government thanks the Old Farts who protected their sorry butts back in the ’60s. If you need more cooling, take a lesson from the Charlton LMG (made from Boer War Lee-Enfields). They kept the standard rifle barrel and FINNED it with alternating aluminum washers and short rings of aluminum conduit, pressed on. Worked fine. Cheap, too! If they are a little bit loose, the flash-hider can be used to keep them from rattling.